Be the first to share your favorite memory, photo or story of Kristine. This memorial page is dedicated for family, friends and future generations to celebrate the life of their loved one. 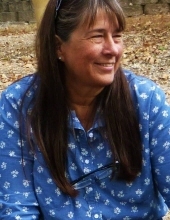 Kristine Kay Dye Yates, 60, of Arma, Kansas and formerly of Independence, Kansas passed away on, April 3, 2019, at the University of Kansas Medical Center in Kansas City, Kansas. Kristine was born on April 22, 1958, to Virgil and Caroline (Chrisman) Dye. She graduated from Independence High School in 1976. She later received her Associate’s Degree from Ozark Community Technical College in Medical Coding. On October 7, 1995 at Willard, Missouri she was united in marriage to Paul Yates and he preceded her in death on December 16, 2014. She is survived by her children; Josh Yates (Jennifer) of Kansas City, Missouri, Tim Shepard (Amanda) of Clever, Missouri, Aaron Yates (Amelia) of Springfield, Missouri and Thomas Shepard (Couri) of Richland, Missouri, brother; David Dye of Pittsburg, Kansas; sister; Ginny Dye (Lawton) of Houston, Texas, eight grandchildren, two nieces, 4 nephews, many cousins, aunts, uncles and extended family members. She was preceded in death by her parents, sister, Peggy Riedle and husband Paul Yates. Services for Kristine will be held Tuesday, April 9, 2019 at 11:00 A.M. at Wickham Family Funeral Home, 216 East 4th Cherryvale, Kansas. Visitation will be from 10:00 until service time Tuesday, April 9 at the funeral home. Interment will follow the service at Mount Hope Cemetery in Independence, Kansas. Memorials have been suggested to the Kidney Foundation and may be left at or mailed to Wickham Family Funeral home at 216 East 4th, Cherryvale, Kansas 67335. To send flowers or a remembrance gift to the family of Kristine (Dye) Yates, please visit our Tribute Store. "Email Address" would like to share the life celebration of Kristine (Dye) Yates. Click on the "link" to go to share a favorite memory or leave a condolence message for the family.